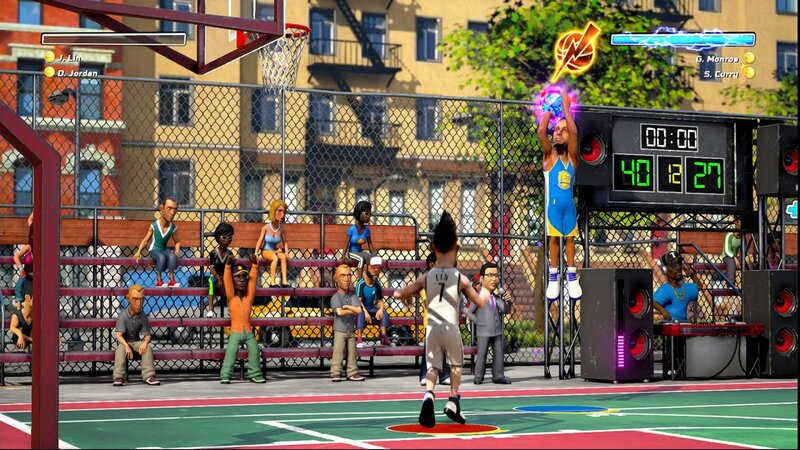 NBA Playgrounds brings back the classic arcade sports game along with a load of fun. Time to slam some dunks, open some card packs and fill the team with famous faces. Time to take a look at NBA Playgrounds for the Nintendo Switch because who doesn’t want to play sports on the go? Immediately after launching the game, one thing was clear for the Nintendo Switch version. In handheld mode, the game looks awful. At least the docked version looks ‘okay’ but even then it’s not as good as the PS4 or Xbox One versions of the game. Developer Saber Interactive have already confirmed that a patch to fix this will be coming, however. Once you get into the game, you’re given 3 card packs to open which contain random NBA players for you to collect and customize your team with. This may be a sports game but it features a lot of collectable card game elements. The NBA players you get from the card packs let you make a team to use in different types of matches. Tournament match wins gives you different unlocks while the Exhibition mode is just for fun against the AI or a local player. Of course, there’s a tutorial however, it’s a very meagre one. Expect to struggle for a while. The AI offers no mercy and naturally, the AI teammate is useless here. He stands there and watches you play until you pass the ball to him and need to control him. As a result, don’t feel too bad if you struggle with getting that first win. While the tutorial is a pain, it does get better after a while. There’s no confirmed method for perfecting a jump shot right now so it’s very inconsistent. To make matters worse, the dunks and layups have the same issue. Essentially, it’s all trial and error so players need to work out what the correct timing is themselves. The AI opposing team performs amazing drunks and steals. As a result, the game feels more like a three-point contest where I need to land three-pointer shots just to stay in the game. It’s a nice added challenge but does mean there was no chance to slam some cool dunks. Each player also has a stamina bar which is hard to read and doesn’t make sense. When the stamina bar runs out, the controller starts to vibrate. Loudly. If you plan on playing in a quiet environment you’ll have to go to the console home screen and turn off ‘Rumble’. The game doesn’t allow you to do this in its settings, you need to change it in the console settings instead. So the AI is annoying and the vibrations can be a pain. There’s another major annoyance. The scoreboard isn’t displayed very well. It doesn’t clearly show what the numbers are on the scoreboard and shot clock. They’re also located in awkward positions which can make reading them even more difficult. So… there’s a lot of issues with NBA Playgrounds then. Despite them, however, it’s still quite enjoyable if you can look past the flaws. The roster is filled to the brim with NBA legends and current superstars making this game relevant to all ages. In addition to this, unlocking new players is based on experience points gained by playing the game. So there’s an actual reason to keep coming back to this game. Plus I actually really like the graphics style for the players, they look like who they’re supposed to yet there’s still a comedic twist. Wrapping up, NBA Playgrounds isn’t as deep as some similar games but the cartoonish gameplay and arcade feel really make this game one to pick up with your friends or at a party.